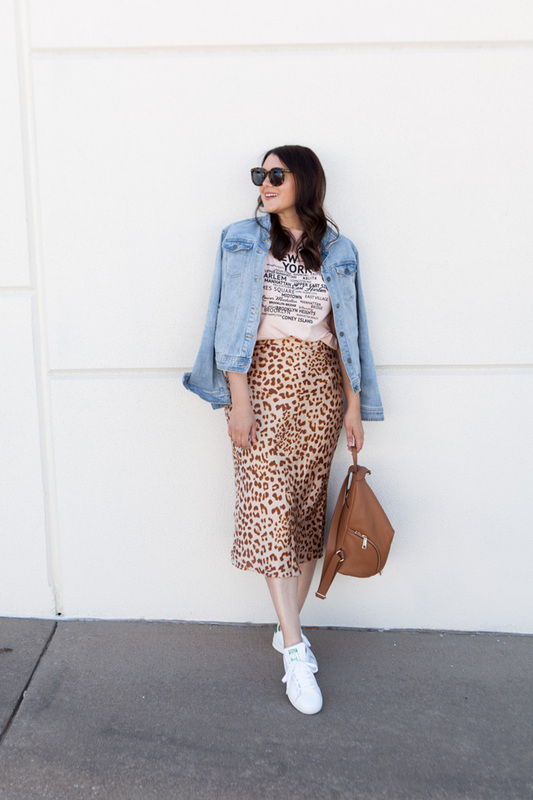 Leopard skirt: So this one is from Free People and I love it. It’s slinky and fitted but is surprisingly mom tummy friendly. I think I am wearing it a little bit higher than the model because my torso is really long, but I found it to be true to size. I’m in the 8, and I am 5’9″ for reference. I think it will be more maxi skirt if you are under 5’7″. 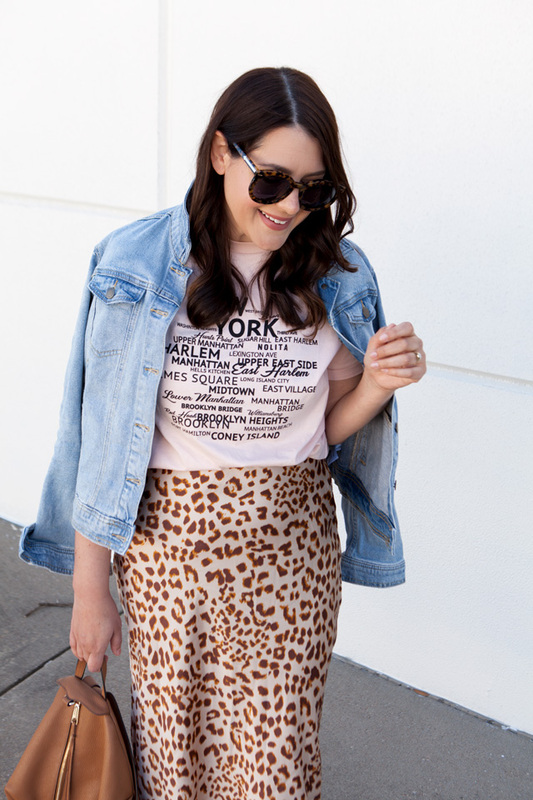 I loved that this skirt had a pink undertone, it feels more approachable from a styling point of view and tones down the animal print vibe that can sometimes be a bit harsh. 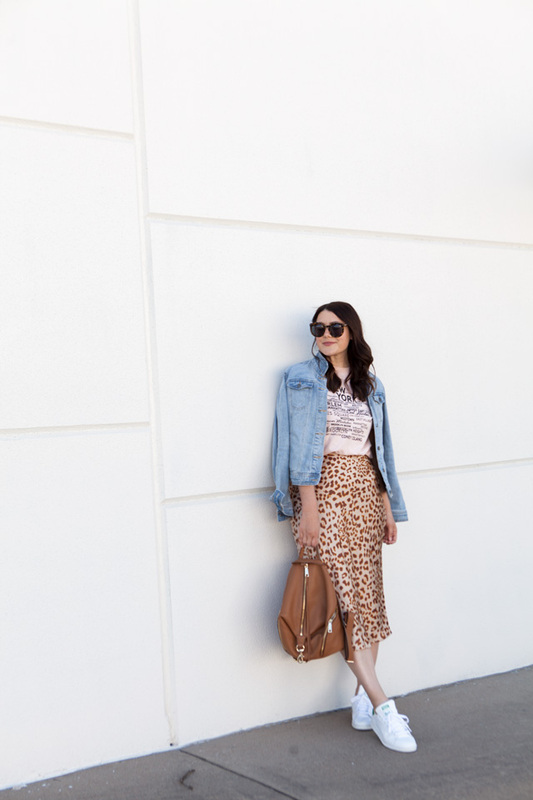 It’s a more feminine take on the animal print trend right now if you will. 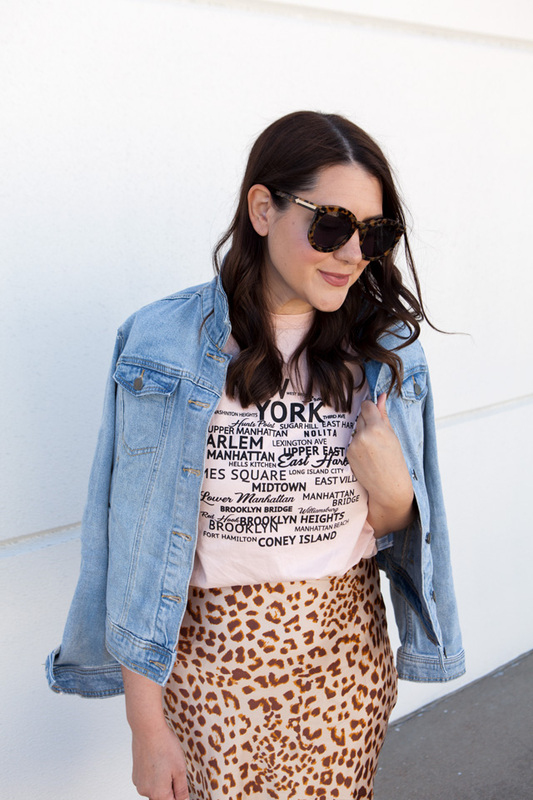 I’ve found a few other leopard skirt options below! You can find this one here! Graphic tee: Look, this skirt works VERY well with a white tee but I felt like that’s what is expected with this look. Expected and welcomed, I should say. If you’re new to this trend, I say start with a white tee either tucked or knotted at the front. But if you want to pick it up a bit, try a graphic tee or something a bit more unexpected. (I would stay away from stripes though! That could become a bit complicated as far as mixing patterns!) You can find my graphic tee here or a simple white tee here. 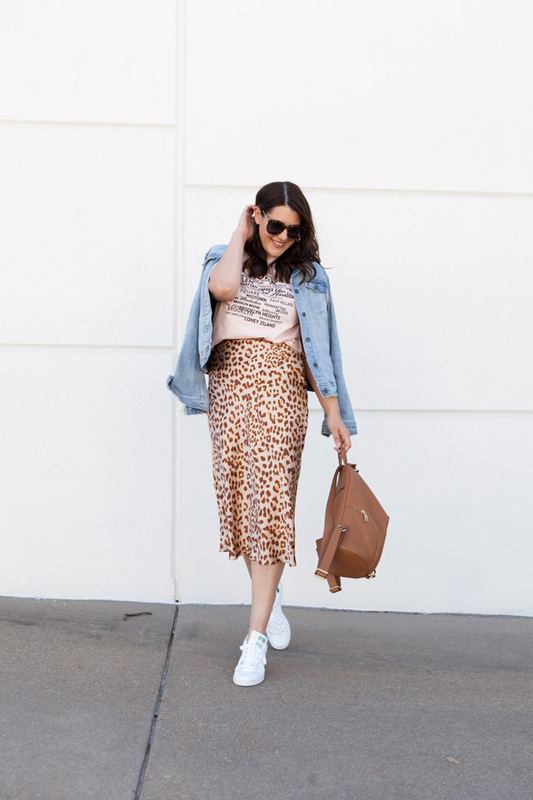 Sneakers: If you search for leopard skirt on Pinterest, you will find this look over and over again. 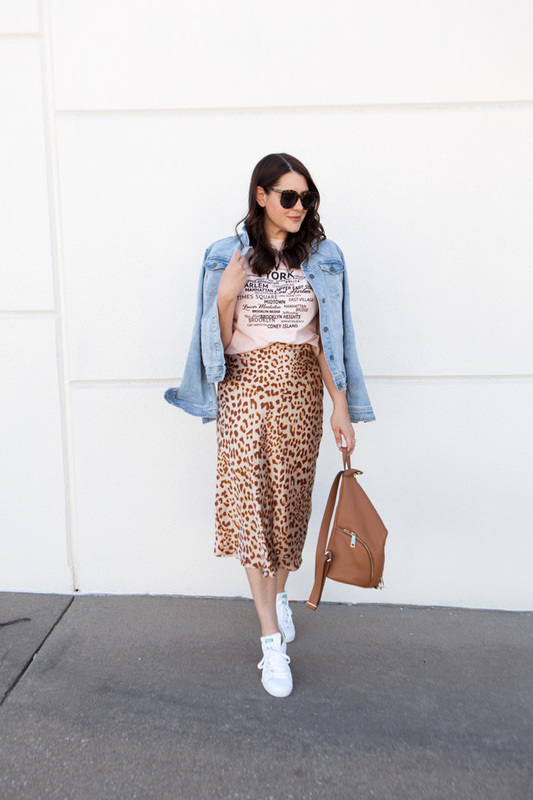 Leopard maxi with sneaks; it’s a vibe. I was excited to pull out some sneakers I’ve not worn in a couple of seasons, my Adidas Stan Smith’s (which recently re-released at Nordstrom!). This skirt is actually quite nice so the sneakers bring it down a few notches. If you aren’t feelings sneakers + skirts, try this skirt with heels or nice pair of pointed flats! You can find my sneakers here. Denim jacket: What ties every outfit together and is the number 1 item you’ll wear over and over again in your closet? That’s right — the denim jacket. I just had to toss this one on to complete my outfit. I picked this one up from Target and sized up one for a ‘boyfriend’ look. I already have a great fitted denim jacket so this one serves as a more casual look. If you want it to fit like the model, stay true to size! You can find it here. So what are your thoughts on this lot of leopard trend? 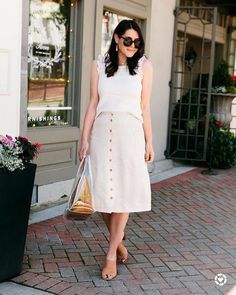 Do you like it in a little dose or a big dose like this skirt? I think I’m leaning hard into the more is more with leopard look! Let me know your thoughts below! I am in the 8 of the tee, it’s relaxed and TTS. I am in the 8 of the skirt, TTS with a more fitted waist. I am in the 9.5 of the sneakers (I sized down a half size.) and I am in the large of the jacket for a relaxed look. Stay true to size if you want it to be fitted. That’s a gorgeous skirt! I love pink undertone too, it’s different and a bit more youthful than anything I’ve seen so far in animal print. I love the leopard skirt! It is so fun and playful. I love that skirt, it’s perfect!